A look at the world of politics, statecraft, diplomacy and books One of the many myths surrounding USA is that it is a great power, a bulwark of liberty in a sea of tyranny. This self serving ideologically laced self representation of USA has made people, especially historians and analysts, ignore certain important aspects of the political and institutional conduct of US. In India, the tele intellectuals of JNU and other leading Universities are only too willing to buy American self ratiocination as the hegemonic weight of post colonial theories seriously impedes our intellectuals from seeing reality from behind the fog of illusions created by American propaganda. India has to learn lessons from the USA, if it wants to be a hard state. Unfortunately the cold comfort of being a soft state gingerly side stepping all important political and security questions is too attractive a prospect for our "intellectuals" to lose. So they continue to mouth the platitudes taught to them by American establishment. A case in point is the controversy over Martha Nussbaum. There are enough morally obnoxious events happening in the USa for this white woman to fret and fume over. But she will issue "fawas" against Narendra Modi and her shrill rhetoric is magnified by Indian intellectuals ever eager to be seen on the same page as the Gucci and Benetton of the American academia. It is in this context that Mark Mazetti's The Way of the Knife is an eyeopener. This book deals with the policies and strategies pursued by the USA in its war against Islamic fundamentalism. What is so striking is the close coordination between the Military and the civilian leadership especially in the fields of espionage and "special operations" US speak for targeted assassinations. Right from the Administration of George W Bush the CIA was involved in an active chase for Islamic militants in Iraq, Somalia, the Horn of Africa and Afghanistan, The hunt had started even before 9/11. The CIA and its method of working is given in some detail. In India we have seen the absolute incompetence of IB and RAW to achieve any national goal. RAW operatives must read this book to get a first hand account of the ethos prevailing in the intelligence community in USA. First of all the Americans rightly think that Intelligence is not the domain for policemen and detectives. Somehow there is a false notion prevailing in India that political and strategic intelligence can be left to policemen. This is like leaving open hear surgery to the chief nurse in the cardiac ward. It is high time India understood that Intelligence is a highly specialized field of expertise and policemen are just not adequate for the job. Another point worth noting is the integrity with which field operatives do their job. They do not white wash reports or tailor them for the political basses. The only instance when this was done was during the WMD crisis when the CIA operatives or eather the outsources espionage hacks filled exaggerated reports. In India the RAW and the IB put up reports with both eyes firmly fixed on the next promotion or the needs of their bosses. Americans usually claim that their Government follows Rule of Law. By and large one can agree with this statement at a very general level just as I will say with utter confidence that in India we have rule of outlaws like Laloo, Mulayam, Karunanidhi and slum dog politicians like them. However, when dealing with grey areas the US Government outsources its policy of inflicting violence. Blackwater is a case in point, Whenever dirty work of killing people or whisking them away for "serious interrogation" read Git Mo treatment, then Blackwater fills the bill. The American tax payer pays heavily so that his President and his Cabinet can deny "criminal culpability" for the actions Black Water carries out. Even in an Outlaw State like India, this kind of deniablity is not possible. The political opposition will not allow the Government to get away with callous, calculated mursder as is done in the USA and Mark Mazzetti has documented several instances of such dubious behavior. The book makes fascinating reading and is written in a racy, page turner sort of style which makes the book more interesting than John Le Carr's Tinker, Tailor, Soldier, Spy. 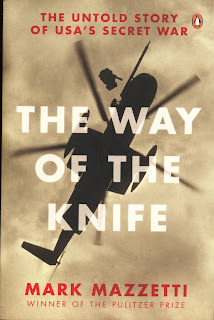 However, the author like all Americans is a bit squeamish when it comes to drone warfare. He hints that there are questions about the legality of such attacks but does not explicitly state that US policy is illega. However, the author has provided enough instances to show that the much vaunted drone warfare has caused huge causalities. In Somalia and in Afghanistan drone attacks has led to more than 5,000 deaths and the body count is rising. I like the book and I reccomed this book to all those interested in US policies in our part of the Globe.